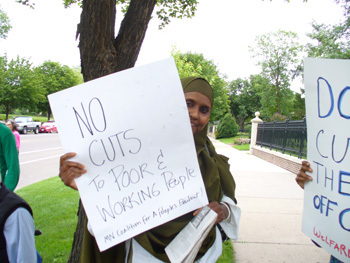 Minnesota:	Protest Blasts Governor Pawlenty’s Cuts | Fight Back! 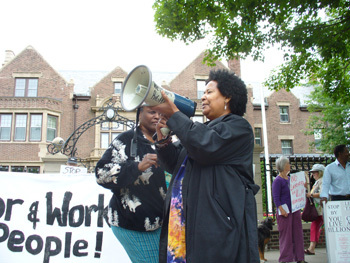 Rosemary Williams speaking at June 30 rally. St. Paul, MN - Chanting, “Hey Pawlenty here’s the fix: Tax the rich, tax the rich,” more than 50 people rallied in front of the Governor’s Mansion here, June 30 to slam Governor Pawlenty’s plan to cut hundreds of millions from health care, education, local government aid and human services. 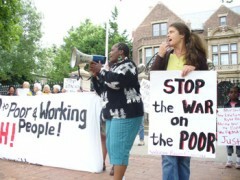 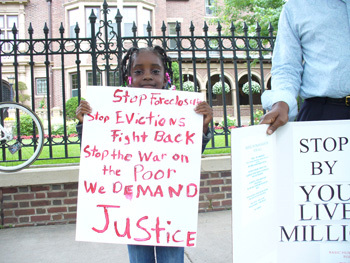 The protest was organized by the Welfare Rights Committee and backed by the Minnesota Coalition for a People’s Bailout.